I'm deviating from Halloween activities a bit today because I needed to share this book I discovered in Vermont. I love it! 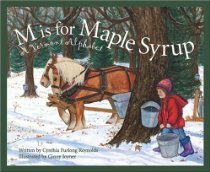 M is for Maple Syrup: A Vermont Alphabet. It is an exquisite book. The illustrations are gorgeous and so is the text. I love alphabet books! Does anyone else like to collect children's books when they travel? I now want the whole collection from each state and I think I'll be buying them from now on when I travel! Wouldn't it be so fun to buy an alphabet book on vacation and then come home and make your very own homemade alphabet book using your own vacation pictures? You can find all the state books here or here if you want some for your classroom. I love this simple homemade alphabet book from Playful Learning. We also made a fun but short alphabet book earlier this Fall. Have you made any homemade alphabet books? What vacation have you been on that would be the perfect one to turn into a alphabet book? Can I tell you that I although I have loved vacationing in beautiful Vermont, I am just dying to get home to hug my little kids and husband!! Hope you have loads of fun planned for this Halloweeny weekend. I have a long airplane ride and lots of reading ahead! Remember to drop by and share on our Best of October link up if you haven't already!! The linky closes on Sunday and we already have about 45 awesome ideas shared... so go check them out!